Selden Eye Swivel 27 The eye swivel is designed for control lines close to the deck, as with dinghy jib sheets. 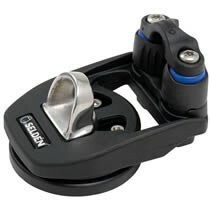 The swivel can also be used on bigger boats if the purchase of the tackle is sufficient. One eye swivel on each side of the coach roof is an ideal set-up for the vang. The crew on the rail can easily reach the vang to prevent a broach. The angle of articulation is easily adjusted with two screws. The swivel turns on stainless steel ball bearings for durability. The eye swivel is made of glass fibre filled polyamide with an electro polished, stainless steel line guide.